The GST Council had last week brought down tax rate on 178 products from 28 per cent to 18 per cent. Arun Jaitley said GST rates were cut on the recommendation of a Fitment Committee. New Delhi: Finance Minister Arun Jaitley today debunked Congress' claim that it forced the government to lower tax on over 200 goods, saying rationalisation of rates was in works for 3-4 months and it is "juvenile politics" to link it to any election or political demand. Rejecting Congress Vice President Rahul Gandhi's demand for a single rate of tax, he said there is scope for further rationalisation of rate but the course will be decided by revenues that accrue from the Goods and Services Tax (GST) that was implemented from July this year. "This rationalisation is 3-4 month exercise," he said, adding that the GST Council decided on the rate cut on the recommendation of a Fitment Committee. The decisions in the GST Council are "all consensus decisions," he said. "This is really juvenile politics to link it with either elections or political demands". 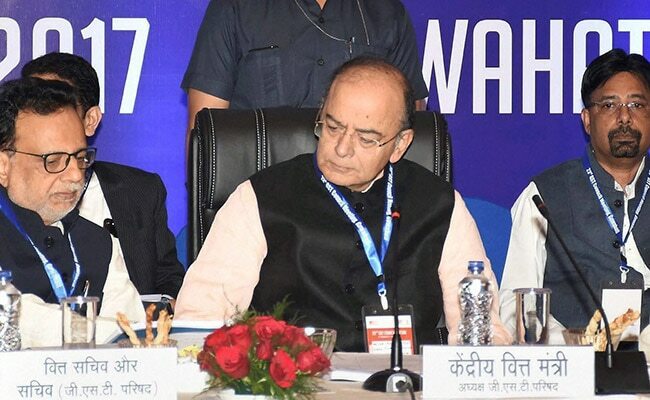 The GST Council, which Jaitley heads, had last week brought down tax rate on 178 products from 28 per cent to 18 per cent and pushed down several others in lower bracket. Congress, which has made high tax rates and increased compliance burden in the GST regime an election issue in the run up to the assembly elections in Gujarat, claimed credit for the move. Its vice president Rahul Gandhi had demanded a single rate of up to 18 per cent GST tax as against 0, 5, 12, 18 and 28 per cent slabs currently. Explaining the rationale for the rationalisation in rates of goods and services that have been done after the launch of the GST in July, Jaitley said the principle objective is that the transition has to be smooth and not abrupt. He said almost every item is better off than it was in July 1. "Those who are speaking of a single rate GST have no understanding of the tariff structure. Food items have to be taxed at Nil. Common man items have to be taxed at the lowest range of 5 per cent. "Luxuy goods, sin products and products hazardous to environment and health cant be taxed at the same rate as aam admi (common man) product. So, wheat, rice, sugar cant be taxed at the rate as Mercedes car or yacht or tobacco," he said. Without taking any names, he said those who speak of single rate have "no elementary understanding" of GST. He, however, said there is a scope for rationalisation of rate. "In 4 months we have rationalised the 28 per cent slab. Such rationalisation (will happen in future) depending on revenue buoyancy will take place," he said. He went on to reel out the benefits of GST saying there is a single rate for products across the country, all inter-state barriers have gone and inspectors have disappeared. "You only have to address software (issue with filing of tax return). I think there is already a net advantage in medium and long term, smooth and a larger market and revenue buoyancy," he said. Jaitley said the government expects all the tax rate benefit to be passed on to consumers, helping bring down inflation. "This is the advantage of an efficient tax system." "Rationalisation process in the transition will always continue. So, wherever there is scope for improvement and procedural simplification will always continue," he said. As the transition from over a dozen central and state levies to a single GST, the Council has been very pragmatic and flexible. "It has not been rigid. We react to market realities," he added. On the decision of lowering tax on food bill in restaurants to 5 per cent from 18 per cent previously, the finance minister said the Council has taken a tough decision to deny the restaurant owners the right to set off tax paid on inputs from the tax on products as they had "unfairly" "pocketed" tax credit and did not pass on the credit to consumers. After the November 10 decision of the GST Council, Gandhi said the Congress will continue to fight for a lower 18 per cent tax for all products. "India need a simple GST, not a Gabbar Singh Tax. People of India and the Congress fought to bring down the rates of many items under the 28 per cent slab. Our struggle will continue to have a single rate and an 18 per cent cap. If the BJP doesn't do it, Congress will show how to do it," he tweeted on November 11. Former Finance Minister P Chidambaram said, "Ministry of Finance must be complimented for 'improving' macro-economic situation in 4 months and 10 days! This is the time taken for common sense to germinate, flower and ripen into a fruit". He said on November 10 that "Gujarat elections did what Parliament and common sense could not do". Jaitley said the Council has simplified the return filing process till March because GST is in its early days and it was important to get people into the habit of filing regular returns. Last week the Council decided to simplify return filing till March 31, 2018, to bring down compliance burden. When asked about anti-GST sentiment, Jaitley said "there is an initial reluctance whenever there is a change. But, I have no doubt that in medium and long term businesses will realise that this is a change for better"